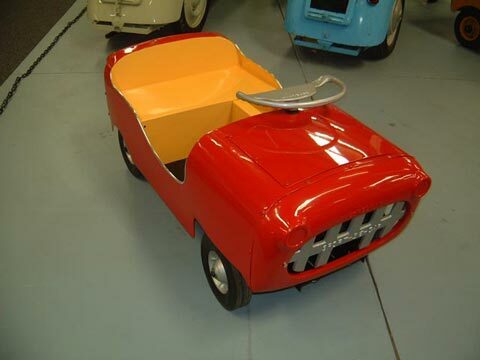 This is an example of the late-style Child's Sport Car, featuring the 1956 cutaway door sides. This example still has the contrasting interior colour ,but the tendency was towards a single colour overall on the late cars. The motor was again the smaller 2hp #6 Briggs & Stratton, and there was a hand throttle only. Colors were red, yellow and blue, with 2-tones available.